Amplify is back! Last year, Guinness Amplify focused more on local rock bands, this year the focus has gone a little towards Indie and Jazzy. My friends and I arrived pretty early as we could not wait to check them out. I personally may not be a fan of any local band at the moment, but I always look forward to exploring new music, especially by our local acts. There are so many talented local artiste in Malaysia but many are not acknowledge simply because they are local. It is an assumption and perception by many that it it's a Malaysian band/singer/artiste, people would immediately shut them out. 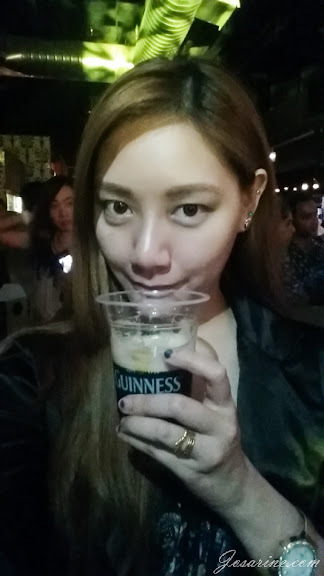 But thankfully that night, a huge crowd of people came and supported Guinness Amplify: Curates at The Laundry Bar @ Curve. I was really amazed by the show up, it was full house! My girls and I wanted to head outside to sit for a while, but the place was so packed and seats were already taken. The night started with Natallie Ng and her sweet and lovely voice. Her voice reminded me of Elizabeth Tan and Norah Jones. Though I may not be a frequent listener or a huge fan of such music genre, but I definitely do appreciate it from time to time. They were amazing! Natallie's bubbly personality and charm on stage soften the hearts of the audience. The next performance was by Crinkle Cut, their music are more towards Indie Pop. To be honest, as they were singing I thought to myself... "my gosh they are really damn good!". Both Crinkle Cut and Natallie, so good that I felt they should be international stars like seriously. From the way they performed on stage I could tell they were not doing this for fame but purely passion for music. Presenting Jumero.... the talented hippie-beach-pop trio. How else would you describe awesome other than the word "awesome" itself? It was definitely a different kind of experience for me as last year's focus was more towards rock. As much as I am not a huge fan of Indie Music... but on this very night I thought to myself... man... they are really good! Do follow Jumera on Instagram, @Jumeromusic and check them out. Jason, Yumi, Ryan, Sandy and Sam. Photo credit to seraphsam.com. Missed Sam so much!!! So happy to see him that night. With my babes, Sandy and Yumi. Congratulations Yumi to your engagement! So happy for you. Hello celebrity blogger Jason Chan. My After Workout Skin Care Routine. I lost 3 kgs in 6 days! A Bubbly Ladies Night to a Relaxing Weekend.